Our first racing weekend of the 2013/2014 season was the event held over the weekend of the 31st August and 1st September and luckily for us it was just down the road from K9 Trail Time HQ. The venue was on National Trust land which isn’t usually open to the public, so the trails were free of wandering general public and perfect for racing on. I went up on the Friday evening just to check out the course, as I was bikejoring with Donnie both days and don’t like riding a course without having seen it on foot first. The temperature was still warm at 7pm but I canicrossed the 5km course with all 3 dogs to see how it ran and was really pleased to find it was all under the canopy of the trees, so felt slightly cooler than I had expected. Disaster struck just before the race on Saturday morning when I discovered that my bike had a flat tyre and I had no spare, but thankfully some friends lent me their bike so that I could continue in the bikejor class. With a quick switch over of the bike attachment and line, we were off on our first race! The start was down a hardpacked track into the woods, then down a steep trail, so that the actual race start chute was slightly uphill and less dangerous than a downhill start would have been. 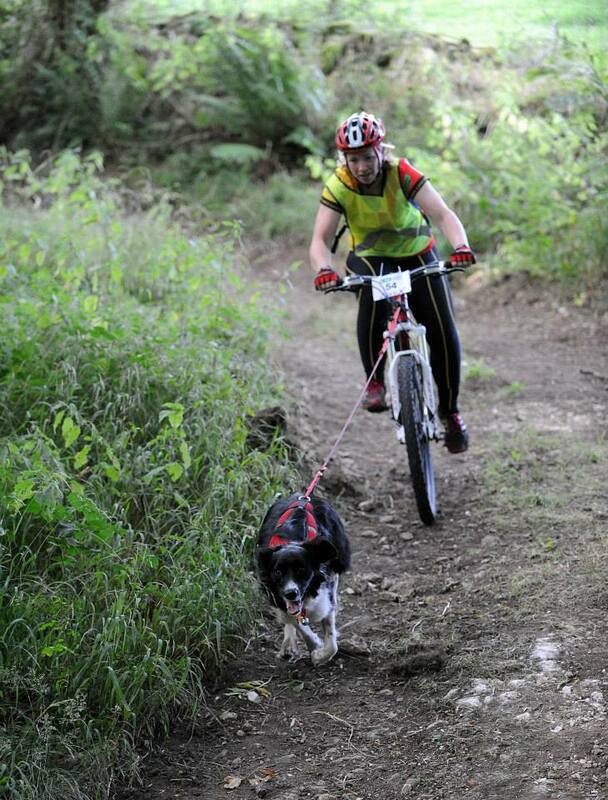 With fresh dogs it is always a relief to see an uphill start at a race! The trail itself was mostly wide and hard packed but with a layer of soft dirt over the top which made it lovely for the dogs to run on, the last mile or so was just the hard packed trail but as this was also all uphill, it was very welcome on the bike. The course wound it’s way around the valley with lots of right hand turns taking you slowly down and around through the trees until you came out at the bottom, where there was a large pond just out of sight on the right of the long course and where the short course ran alongside. The uphill section back to the finish line was definitely tough and had me feeling the burn of not having been able to train on the bike for so long over the summer but we completed Saturday in a respectable time without incident. I managed to get a new inner tube for the bike on Saturday afternoon and so had my bike back in action for the second day of racing. Sunday was the same course as usual, we both felt tired from our efforts on Saturday and with temperatures not being as low as previous racing at the same time of year, it was hard work to get up that hill at the end. Donnie did his best for me however and we managed to cut a few seconds off our Saturday time to keep us in first place in the female class. I really enjoyed our first races of the season and with the course being all under the trees and on private land, it was a course I will look forward to riding again in the future. I wouldn’t say this was a very technical course for either the bikejorers, scooterers or canicrossers, but that did not stop it being a challenging one, due to a few sharp turns and the uphill slog to the finish. I would highly recommend this CaniX event to those wanting to test their stamina and it certainly proved to me I need to get working on my fitness before I can expect some better times.